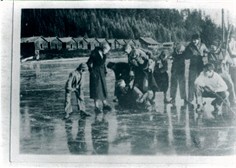 For about a decade, from 1915 to 1925, Mabel Oregon might have been the most ethnically diverse community in Oregon. The Coast Range Lumber Company employed over 150 people from all over the world. The 1920 US Census shows almost thirty Japanese, including children. A newspaper article from 1925, shown below, refers to "the Japanese colony at Mabel". Coast Range Lumber Company was partly owned by the large Dollar Steamship Line. Their ships brought most of the new immigrants across the Pacific Ocean. A 1917 World War I draft list below shows a number of Greeks, Italians and six Japanese men. Today, much of the area is part of the Shotgun Creek Recreation Area and managed by the federal BLM. 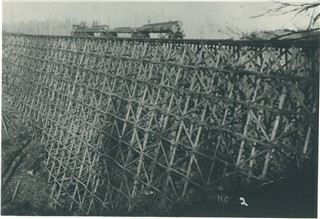 The railroad trestle shown above was one of the largest in the world at the time. The bridge was almost 200 feet high and over 800 feet long. It helped bankrupt the Coast Range Lumber Company because it costs so much to build. Louis Polley's book, A History of the Mohawk Valley, says on page 117 that the Dollar Steamship Line foreclosed on the mill in 1924. 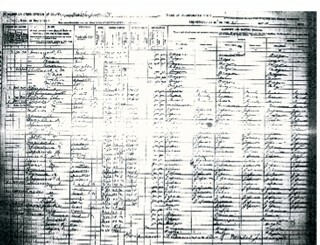 Here is a scan of the 1920 Census. Also, see the 1917 World War One draft list below. The Mabel Cemetery has the graves of two Japanese men, whose names are unknown. Mabel Oregon was also the site of a Brethern Church and a large number of the community were part of this church. The Brethern came from Germany to escape persecution and were very progressive in their views on war, race relations and women in the pulpit. The Church of the Brethern have always been pacifists who serve in non-combat positions in the military such as managing hospitals. Their old cemetery in Mabel has the graves of two Japanese men whose names are unknown. I put markers on their graves on August 20, 2003. A January 29, 1925 newspaper article tells of three Japanese men who were arrested for making sake, a Japanese wine, during prohibition when alcohol was illegal. The article ends on an upbeat note. It says that one of the men arrested could not come with the sheriff today, as his wife had just had a baby. A Japanese student from the University of Oregon was be called to help translate their legal case. It is unknown how many people made up a "colony", but since in 1920 there were up to thirty Japanese, there would probably be more by 1925. Louis Polley's book says they had a "settlement". What happened to them is still partly a mystery, although they probably left the area when the Coast Range Lumber Company went bankrupt and the mill closed. "Sheriffs deputies, led by chief deputy Van Svarverud, raided the Japanese colony at Mabel yesterday afternoon and arrested three men on a charge of unlawful possession of liquor. Y. Koto and Y. Kaysmashima late in the afternoon pleaded guilty in Justice of the Peace and were fined $15O each. 0. Shnaiyu, who was also arrested promised to come to Eugene later. He said he could not very well come yesterday as his wife had just presented him with an heir. The officers stated that they found about five gallons of sake, a mild Japanese intoxicant, home made beer and wine. A Japanese student at the university, was sent for before the case could proceed, as the two men in court could not understand and speak but little English." Here is a photograph of houses used by Asians at Coast Range Lumber Company. The picture was taken years after the houses were abandoned. 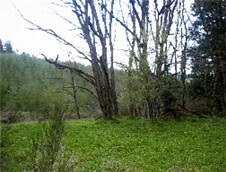 This photo shows the area today. 1923 Oregon legislature illegal for Japanese to own or lease property. As many as one third of the Japanese in Oregon left the state. When the mill went bankrupt the Asians may have been forced to move to other areas. One local person says they went to Eastern Oregon to do gold mining and logging after the lumber mill completely closed in 1926. Perhaps we can locate their descendents using the old census records and learn more about them.